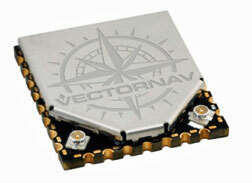 [Satnews] VectorNav Technologies has introduced the VN-360 GPS-Compass heading and position sensor. The VN-360 is an OEM GPS-Compass module that provides an accurate, True North heading solution for systems integrators seeking a reliable alternative to magnetic-based sensors. Many systems currently available on the market depend on digital magnetometers for providing heading measurements of a manned or unmanned platform. However, the majority of these platforms (e.g., multirotor UAVs, ground robots or satellite antennas) also include ferrous materials, motors, batteries or electrical components that drastically limit the ability of a magnetometer to provide an accurate or reliable heading solution. VectorNav's VN-360 provides a miniature, cost-effective GPS-based alternative that is unaffected by these magnetic disturbances and changes to the magnetic environment. The VN-360 is ideal for applications such as antenna pointing, multirotor UAVs and aerostats, automated agriculture, heavy machinery, ground robots, weapons training and warfare simulation, and direct surveying among others. The VN-360 joins VectorNav's line of inertial sensor systems, which includes the VN-100 IMU/AHRS, VN-200 GPS/INS and VN-300 Dual Antenna GPS/INS, and will be on display at VectorNav's booth #347 at Satellite 2016 in National Harbor, Maryland, from March 7-10, 2016. "The VN-360 is like no other product on the market in that it provides a cost-effective solution for the difficult challenge of obtaining an accurate and reliable heading solution," said VectorNav President, John Brashear. "VectorNav's GPS-Compass technology marks a turning point in the way we approach heading measurement and will improve the capabilities and performance of a variety of next-generation manned and unmanned systems."